As noted, RAW General Manager Kurt Angle announced on this week's show that Ronda Rousey has been suspended for 30 days after Rousey assaulted new RAW Women's Champion Alexa Bliss, Angle and a few referees. Rousey made it clear that she will be going for Bliss when the suspension is up. 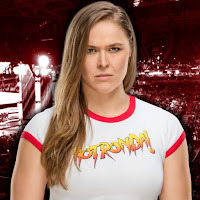 Ronda Rousey has been suspended from Monday Night Raw for 30 days after attacking Raw Women's Champion Alexa Bliss, two WWE officials and Raw General Manager Kurt Angle. The incident occurred one night after WWE Money in the Bank, where Bliss caused Rousey's Raw Women's Championship Match against Nia Jax to end in disqualification. The Goddess then cashed in her newly won Money in the Bank contract on The Irresistible Force to claim the title. Jax will challenge Bliss for the title in a rematch at WWE Extreme Rules. Rousey, meanwhile, will be barred from Monday Night Raw until Wednesday, July 18 — three days after that event.